Next time you go to the nail salon, there's a new shape you can (but probably won't want to) ask for besides square and round. Enter "molar nails," aka the stuff of manicure nightmares. Russian nail artist Nail Sunny is the mastermind behind this mildly terrifying work of art, and posted it to Instagram. It's since gone viral for being equally creepy, fascinating and amazing. To create the look, she used a brush to mold the acrylic into a tooth shape. It's actually the same process that's normally used with acrylic nails, except for the fact that they look like teeth instead of nails. So kind of the same, but uncomfortably different. 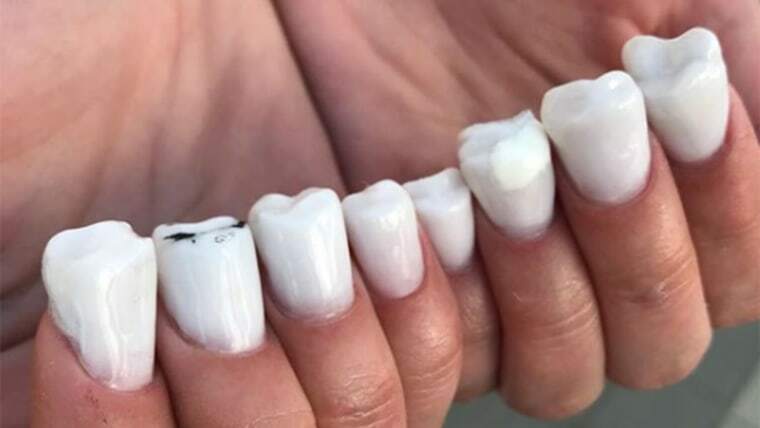 Crazy nail trends are nothing new on the social media and, believe it or not, molar nails are hardly the worst offender. There were furry nails, bubble nails and so many more, each of which had us wondering, "Why????????????" According to Rita Remark, lead educator of nail polish brand Essie, it doesn't seem like many people will realistically be chews-ing to turn their nails into dentures. "In my opinion, trends like these are meant purely for entertainment," she said. "Do I find them funny? Absolutely! I even appreciate the skill required to create these mini sculptures and polished paintings. However, would I recommend trying them yourself? Definitely not." Social media has allowed nail artists to share their work with a wider audience, Remark explained, and many have used the platform to flex their creative muscles in an entirely new way. "In any art form, people are going to want to push the medium and do wild and zany things," said Remark. "Designs like these are never really wearable, but they’re great for conversation!" Safe to say we won't be chomping down on this trend any time soon, though it will likely be haunting our dreams for a while. See the top nail trends to try now with our A-Z nail GIF-tionary.